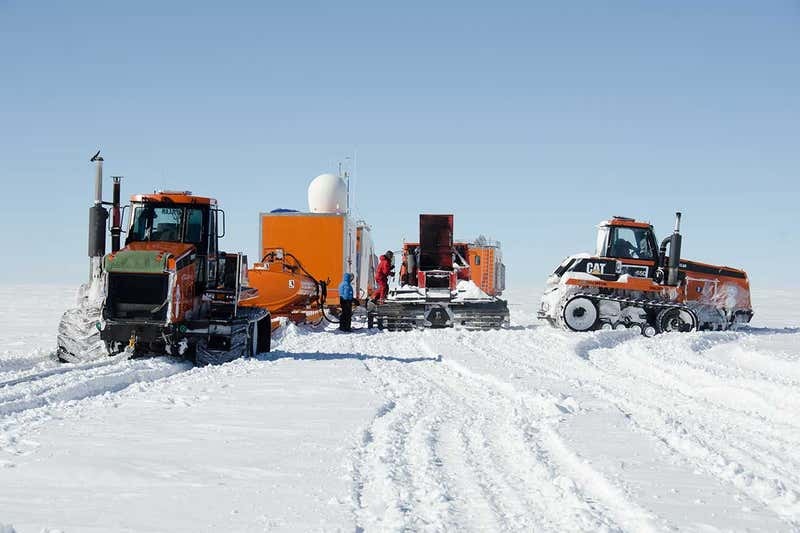 A 14-person team on a €13 million European project will head to the East Antarctica ice sheet later this year, to begin drilling an ice core several kilometres deep. Researchers will use the bubbles of carbon dioxide and other gases trapped inside ice cores to provide a window into Earth’s past climate. Details of the “Beyond EPICA” project – which hopes to find ice dating back 1.5 million years – were announced this week at the European Geosciences Union Conference in Vienna, Austria. So far, the oldest ice ever to have been drilled was a core that dates back 800,000 years, unearthed 15 years ago. But that leaves a gap in our knowledge of a key period when Earth’s climate shifted, known as the mid-Pleistocene transition. This period saw the world change from a rhythm of switching between warm and cold phases every 40,000 years, to a cycle every 100,000 years. There are competing theories for why this happened, and the new expedition hopes to provide the evidence to explain it. “We need to understand why we have this change 900,000 years ago, and why we live in a 100,000-year [cycle] world. Without [doing] that we cannot say we really understand our current climate systems,” says Barbara Stenni of Ca’ Foscari University of Venice, Italy. The ice will also provide crucial new data to improve modelling of how our planet’s climate will evolve in the future, she adds. The team have spent the past three years using radar to look below the ice, searching for the place friendliest for drilling and most likely to yield ice that is old enough. Their work suggested a site known as Little Dome C, 40 kilometres from the Concordia station in East Antarctica. For example, the team could end up with no fuel if there are delays transporting it from Australia. The drilling bit could get stuck in the ice and require a new hole to be drilled – as happened to the researchers who drilled the 800,000-year-old ice core. Time is critical. There is only a two-month window each year when the Antarctic weather will allow people to work, so even with drilling around the clock, the project will still take years. The team expect to drill down 2.7 kilometres. But because the oldest layers of ice are compressed by the weight of the newer ones pressing down from above, researchers are unlikely to be able to peer beyond 800,000 years until the last 200 to 300 metres of ice. That should happen by 2024. While researchers are confident they will find ice old enough, there is no guarantee it will go back as far as they want, or that the layers will be stratified clearly enough to distinguish between them. “We have a very large chance to get 1.5 million years, a more than 90 per cent chance,” says Catherine Ritz of the Institute for Geosciences and Environmental Research in Grenoble, France.